“I am satisfied that happiness in marriage is not so much a matter of romance as it is an anxious concern for the comfort and well-being of one’s companion. Any man who will make his wife’s comfort his first concern will stay in love with her throughout their lives and through the eternity yet to come”. It IS a wonderful quote, but may I share another quote that I feel completes the picture? I love these quotes...together. They worked at their marriage just like everybody else and had adjustments, possibly arguments and trials. Hope for each of us when we fall short of treating our spouse with loving kindness. 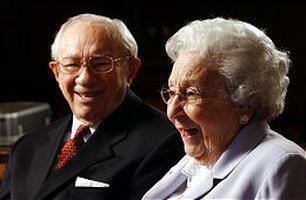 In every way they were a wonderful example of a strong and fulfilling marriage.